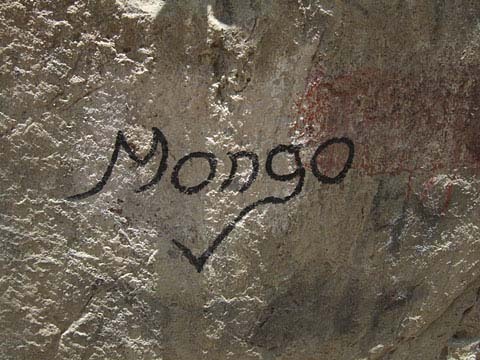 "Mongo", 9a (UIAA 11), got almost 4 years after the first ascent and unbelievable 19 years after it has been developed its second ascent on 6th of March 2008. Once again "Magic" Heli could do an incredible effort and climb this 25 m long and extra steep powerroute in worst conditions with temperatures around zero and without sun. Now Heli is amongst the illustrious circle of 3 climbers which could climb a route in the grade 9a at the Schleier Wasserfall. 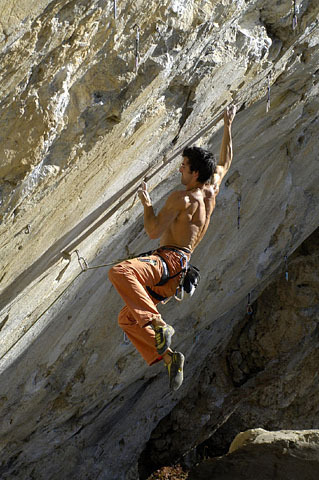 Already some days before missing concentration caused that he missed a hold already after the real crux-move. But this time Helis motivation and concentration have been 100%. After the super hard lower crux moves follows something like a rest point - better to say a point to relax a bit, as you are in the middle of an 8b there. With such low temperatures it was really a problem to get back enough energy for the following dynamic 8b+ passage. And he was really super close to falling there, the hardest move of the sequence was still quite stable, but the fingers got colder and colder and so the move into one of the following holds was extremely close. It is evident that at this place of the route you give all you have and so did Heli. After an impressive fight he got the first "jug" and now the rest of the route in the grade 7c is only a formality for him. And of course thats the reason why he is so happy now on the telephone!!! Last year we did not hear a lot from the strong boy from Rosenheim, but this does not mean, that he has been lazy. The last two winters Heli worked concentrated to improve his maximum power and he could repeat some 8c-routes at the Schleier Wasserfall. At the Geisterschmidwand close to Kufstein he could repeat Wagnis Orange during his spring-training 2007 (the first ascent of a harder starting variation of this route he could do already in the year before, see Unverhofft kommt oft). Then he checked out a new combination of which he could do the first ascent some weeks later and which is somewhere in the grade 8c+. 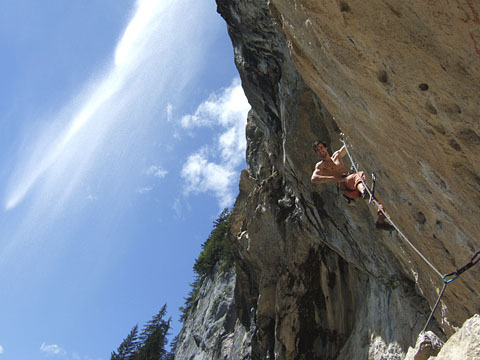 During a "training-visit" at the Rottachberg he repeated Chri-Su (8c) and Basika (8c) on the same day (he did both routes already in the year before). That he can do these incredible efforts beside his difficult studies of mechanical-engineering (and Heli is taking his studies really serious) is possible only because of his enormous motivation and the fun with which Heli is going out on the rock. After his success in "Mongo" Heli made a short trip to Osp. And if you think that the strong boy from Rosenheim went there to rest a bit and to climb some easy routes you don't really know him very well. The route "Conecmira" (8c/c+) was still on his list of projects from the last years but this time it could not resist very long against such concentrated power.